Earth’s ability to sustain life depends strongly on volatile elements like carbon, hydrogen, sulfur, and nitrogen that make up a large proportion of our atmosphere, allowing us to breathe and keep warm in cold space. 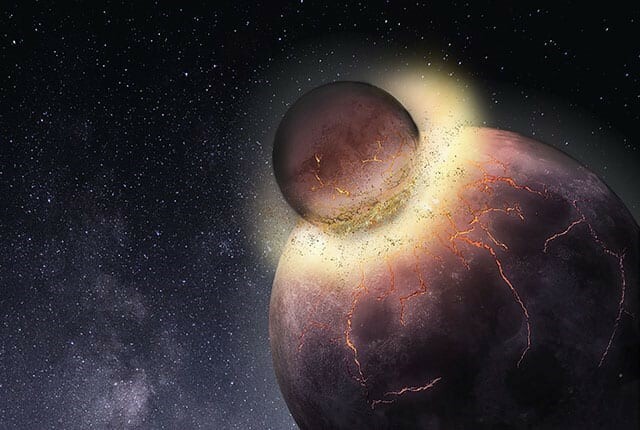 A new study led by Rice University graduate student Damanveer Grewal suggests that most of these necessary elements may have been delivered to our planet when a Mars-sized planetary body smashed into early Earth more than 4.4 billion years ago. The late addition of these volatiles via primitive meteorites has long been considered the main mechanism of volatile element delivery to Earth. But such a mechanism did not explain the geochemically anomalous nitrogen content compared to carbon. Therefore, the timing and delivery mechanism of these elements remained an unsolved mystery.